If you want flooring that is cost-effective, stylish, and strong shop for vinyl flooring from our reputable flooring store. This flooring option has plenty to recommend it. 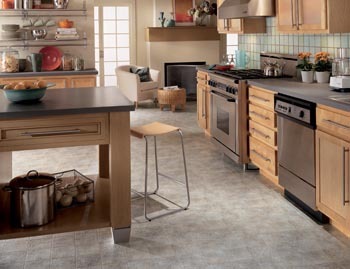 Today’s vinyl is beautiful with looks that imitate tile, wood, and natural stone. Come into our showroom to see hundreds of samples of vinyl in many different patterns and styles. Our showroom offers you a multitude of choices when it comes to vinyl. We have a variety of styles, as well as sizes, brands, and colors. Vinyl in sheets of 6’ and 12’ is always a popular choice for busy homeowners. This is because the vinyl is so easy to care for. All you need to do is sweep away dust and dirt and mop in the shine. When you are in search of flooring that is easy to clean and needs no maintenance, select vinyl sheets. If you covet the look of hardwood flooring, but prefer a flooring surface that costs less and does not need as much care, vinyl plank flooring is made for you. These floors provide the look of hardwood and come with the durability of vinyl. Our vinyl plank floors have the grain and gloss that make hardwood so appealing. Now that you have made your decision about flooring, we are happy to schedule professional installation. On our staff are experienced flooring technicians who have been doing this for years. They know how to make that vinyl look stunning and last for many years. Reach out to us for new floors for your home and professional vinyl flooring installation.